The kitchen is a hard place to keep clean, but it can be done. For instance, if you decide to get the best mop for tile floors, you will surely have to spend less time and expend less energy to clean up inside the kitchen. In this article, I’ll tell you more about some of the top mops on the market and we’ll also dive deeper into how these products can help keep your kitchen spotless. What Kind of Mop Do I Need to Use for Tile Floors? What Do I Need to Look for to Find the Best Mop for Tile Floors? Sometimes the messes you encounter in your kitchen require a more intense type of cleaning, while other times, a gentler approach is needed. Making those adjustments is easy if you’re just cleaning with a washcloth, but the same is not true for most steam mops. The Light ‘N’ Easy Steam Mop differs from most steam mops in that regard though. The manufacturers added a manual pump to this item that changes the amount of steam released depending on how fast the mop itself is moving. That means that you can more effectively remove a stubborn stain on the tiles by moving this mop faster. Of course, doing that will cause you to encounter a problem. The water tank installed on this steam mop is very small and it will empty in a hurry. It’s a good idea to just bring a container with the solution inside with you as you clean to cut down on the number of times you have to go to the sink. I still regard this is as a solid cleaner, but the glaring issue with its water tank prevents me from naming it as the best steam mop for tile floors. Specially designed pump works to adjust to your speed. This steam mop is lightweight and easy to carry around. A specific design of the handle makes it possible for you hang this item on the wall when it’s not in use. The water tank installed on this steam mop is way too small. The Easywring Spin Mop from O-Cedar is the item most unlike the others included in this article because of the way it’s designed. It’s a pretty classic mop that you push and pull on while cleaning, but while its design is conventional, its features have been modernized. It makes use of microfiber so that it can easily pick up any dirt particles on your kitchen floor and the triangular design of the mop head allows it to fit into the corners of your kitchen. I especially love the bucket you get along with this mop. You can push on its foot pedal to wring out the mop and it also has a splash guard that prevents the mess you just cleaned up from getting sprayed on to you. My main issue with this mop is that the spinning becomes hard to rein in at times. That’s especially true if the mop head is weighed down by the liquid you cleaned up. There will be times when you’ll go to lift the mop to wring it and it will spin instead and leave a bit of a mess behind on the floor. Some more stability in that regard would have done a lot to improve this mop. Mop is suitable for heavy-duty cleanup jobs. The mop head is designed to fit into the corners of a room. 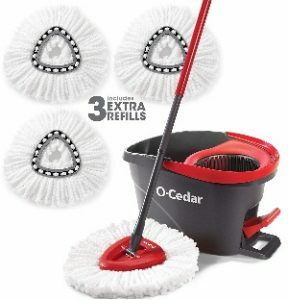 Bucket included with this mop is easy to use and cuts down on your cleaning time. The mop head tends to get a bit out of control every now and then. All the countertops and cabinets that typically clutter up the kitchen contribute to making that part of the home tougher to clean by creating hard-to-reach areas. Some people may just leave those hard-to-reach areas alone instead of trying to clean them. 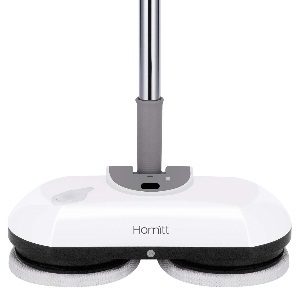 If your kitchen has an abundance of hard-to-reach spots, then it may be a good idea for you to get the Cordless Electric Spin Mop from Homitt. It’s a lightweight and cordless mop that you can take to any spot in your kitchen. If it’s been ages since you were able to clean beneath and behind some of your kitchen fixtures, then just adjust the handle on this cordless mop and get to work. As long as you remember to charge this spin mop for about four hours before using it, you should be able to keep cleaning for a while. The only thing that will disrupt your cleaning is the constant need to refill this mop’s water tank. It’s on the smaller side and it will go empty often while you’re cleaning. Evaluating it based on performance alone still puts it in the running to be considered as the best mop for ceramic tile floors. 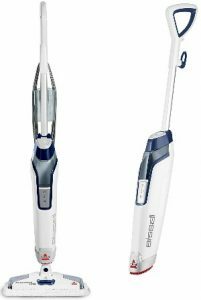 It’s cordless and lightweight, a user-friendly combination. The mop handle is adjustable, so find the working length you’re comfortable with. Scrubby pads included are easy to operate. Water tank is on the smaller side, meaning frequent refills will be required. As nice as it would be to always have a spotless kitchen, people don’t always have the luxury of taking time out of their day to devote to cleaning. In all likelihood, you have more important things to do that will take precedence over cleaning the kitchen. To make the most out of what time you do have to spend cleaning, you can use the PowerFresh Steam Mop from Bissell. The standout feature of this steam mop is its flip-down easy scrubber. That additional feature lives up to its name as it really manages to get rid of messes on your tile floors effortlessly. If you decide to use the fragrance disc, you can end up with a sparkling and fresh-smelling kitchen within minutes. This item is at its best if you’re just using it to clean a small spot in your kitchen. 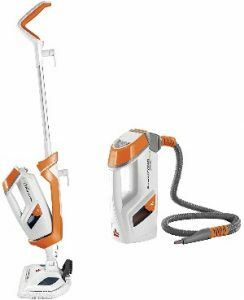 Should the need arise for you to move around while cleaning, this steam mop will not be as convenient to use.? That’s because you will have to wait for it to warm up again before it can be used. You won’t have to wait for a long time, but it’s still annoying to have to constantly start and stop while in the middle of cleaning. Easy scrubber gets rid of messes remarkably quickly. Fragrance disc works well and leaves a pleasing odor in its wake. Variable settings allow you to choose the level of heat you need. You will have to wait for this item to warm up for about a minute every time you turn it on after plugging into an outlet. Mopping is hard work. Over the course of cleaning your kitchen, you’ll have to move around a lot to get to the right spots and make frequent trips to the sink in order to get some fresh cleaning solution. To help make the job of mopping your kitchen floor just a bit more manageable, you can start using the PowerFresh Deluxe Steam Mop from Bissell. The long power cord frees you up so that you can move around your kitchen with greater ease. The sizable water tank means you can take more solution with you with every refill. It also helps that the mop itself is easy to operate. You even have the option of changing the steam setting to better suit what you need for cleaning. This is a pretty solid steam mop all things considered, but the reason why it’s not the best mop to clean tile floors is that it’s not very versatile. It struggles when you have to mop a surface that isn’t flat and there are no extras included that work to make it useful in other ways. Sizable water tank means you won’t need to refill as often. The power cord is long and will not restrict your movement significantly. Settings enable you to adjust the amount of steam needed for cleaning. You’ll be hard-pressed to describe this steam mop as a versatile performer. It’s hard to find a mop that can handle all the cleaning jobs inside your kitchen, let alone your home, but the PowerFresh Lift-Off from Bissell comes pretty close. The manufacturers have included all kinds of accessories together with this steam mop. The ones I enjoy using the most include the extension hose, the angle tool, and the grout tool. You can perform specialized types of cleaning using this handy cleaner. To be clear, even if you just stick to using this item as a plain old steam mop, you will still be satisfied with its performance. Based on performance this model considered as the best mop for tile floors. It is worth pointing out that this is a heavier mop and that it has the same warming up the issue I noted earlier while reviewing the PowerFresh Steam Mop. That issue remains inconvenient, but it’s not a big enough annoyance to keep me from using this mop. 13 different accessories are packaged together with this mop and they can be used for specialized cleaning. This item produces enough steam to clean up just about any kind of mess in the kitchen. Water tank included is a good size. You will have to let this mop warm up first after you plug it into an outlet. You can approach the challenge of cleaning tile floors in your kitchen in different ways. More often than not though, you don’t need to overthink things. You just have to react accordingly to what kind of cleanup job is in front of you. If there’s a big spill in the kitchen caused by a pot tipping over or some bottles breaking, you’ll need something capable of heavy duty cleaning. A more conventional mop that makes use of microfiber is a good candidate for bigger cleanup jobs. For regular kitchen maintenance, Mariette Mifflin the author of the Spruce notes that a steam mop will work splendidly. The type of cleaning provided by a steam mop can bring out the beauty of kitchen tile floors. It would be ideal to keep a more conventional mop and a steam mop around if you always want your kitchen to look its best. Breaking out the mop right away to clean tile flooring is not a good idea, especially if the mess you’re looking to clean up is not pure liquid. Before you start mopping, take some to either sweep or vacuum the floors first to prevent them from getting damaged, according to one of the posts of DIY Network. Depending on the type of mop you’re using, you will either need to apply a mixture of water and detergent to the tile floor by moving your mop over the mess or you may have to open the water tank and pour the detergent and water mixture in there. Once that’s done, you just have to move the mop along the mess to clean it up. This video shows you what kind of motion is needed if you’re using a steam mop to clean a tile floor. You don’t have to rush the cleaning process and it would probably even be better to work methodically to make sure the entire mess is removed. Don’t forget to frequently change the cleaning solution or else you’ll just be lifting and dropping the mess constantly on your floor. Above everything else, the mop you want to use for cleaning tile floors should feature microfiber cloth. Microfiber cloths excel at clinging to the smallest particles in the messes you’re trying to clean up, according to Chris Woodford author of Explain That Stuff. Other materials aren’t quite as adept at picking up those microscopic fibers, meaning they aren’t cleaning as thoroughly as well. If you decide to get a steam mop for tile floor maintenance, you should prioritize finding one that comes with a larger water tank. With a larger water tank, you won’t have to change the cleaning liquid as much because you’ll have more of that to work with every time you fill up. It’s also a good idea to get one of those steam mops that is packaged together with extra accessories. More often than not, those additional accessories will prove useful for doing things such as cleaning tile grout and getting to hard-to-reach spots in your kitchen. 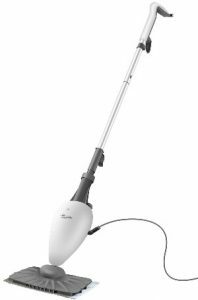 After taking a closer look at all of the previously mentioned, I can confidently say that the PowerFresh Lift-Off Steam Mop from Bissell is a cut above the rest. It’s heavy and is saddled with that warming up an issue, but those minor flaws do little to take away from the versatility of this product. The accessories included with this mop allow it to be useful in so many varied applications. It’s the best mop for tile floors and grout reviewed in this article. Even if you’re just going to use this steam mop for floors, it will perform well thanks to the microfiber pads and other modern features. 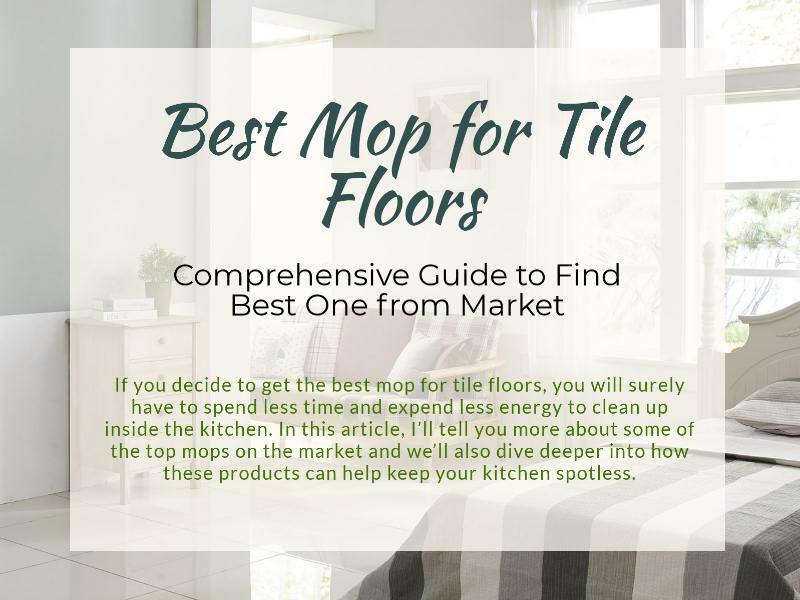 I hope that you’ve enjoyed reading this article on the best mop for tile floors. Cleaning the kitchen will rarely ever be a pleasant process, but you can make it significantly easier by using the right mop.